particular when it comes to online business. Before I get going I want to clarify one thing however. Automation by no means is a bad thing. In fact, it is one of the main ways of being able to scale a business. Companies automate their process where possible if they can “replace” exactly what “people” are doing and so with such accuracy. It can be done within the online world as well as there are examples of quality automation in the “keyword research” field, testing and analytical side of your website data. This is completely fine and you will never hear me argue against automation that improves business efficiency and that does a fine job of intervening and taking over “human inefficient” jobs. That is right. There is automation, and then there is Lazy Automation, a term I have defined for tasks that SHOULD NOT be automated and in fact, all the tools that perform Lazy Automation do a worse job than the human function and they will also many times, KILL YOUR BUSINESS. 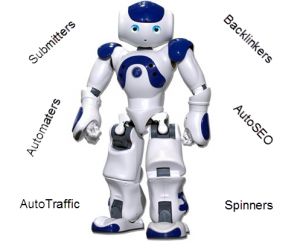 Anything that claims to automate SEO is going to hurt your business…1000% of the time. Here are how these tools work. They find a little hole in Google’s algorithm that encourages some form of “gaming” (manipulating the rankings). Someone goes and creates a tool that fills this void. It might even work for the first few weeks and sometimes months…then Google comes knocking on your door (not literally) and will derank your entire site. SEO is an “human” process. You should not be “automating” any aspect of SEO, you can instead outsource different components of your SEO operations like creating content, the actual content submission process, keyword and market research, and actual development of your website. Unless you are still living in the 2010 Stone Ages or you are getting taught by someone that has no clue what they are doing, you shouldn’t even be working towards backlinks. With an update back in 2012, Google truly put the pinch on the value of backlinks within their search algorithm and now they can actually do more harm than good. There are many backlink tools and software out there that claim to get you lots of backlinks and they do exactly that, however these are AWFUL for your SEO presence in search engines and will actually put a big red flag beside your domain within the search engines. Google is good at determining whether backlinks are quality or not and whether or not your backlinks are proportional to your website traffic and overall content base. Avoid ANY backlinking tool. Backlinks of this nature are bad for business and the people that use these tools are the ones that cry for help with every Panda and Penguin update. I see it all the time. If you have ever read an article that for some reason just didn’t seem right, chances are you were reading content that was being automated via article spinners or one of the various “content automation” tools out there. If there is one thing that I have learned in my 10 years in the online world, it is that those who are not willing to learn how to create content for themselves within their niche or find a quality writer, are those that have a short lived business. You cannot automate content. You cannot expect content automation to make sense to the end user. Remember who you are creating content for. If you still think you are creating content for Google, then you need to find a new mentor within the online world. You are creating content for READERS. Your website visitors are the ones that bring value and if you cannot deliver them value via your content (something that cannot be automated), you are going to experience very little success online. This is probably the most laughable of them all. You cannot automate traffic unless you are paying for traffic through mediums like Google Adwords or BingAds (or you are doing ad buys). Any company that claims they can automate traffic for you is using slight of hand, smoke-and-mirrors magic on you. It is not possible and no tool can go out and get you traffic in an automated sort of way. If you get sucked into one of these scams after reading this, it is your own fault because you have be forewarned. A trend in the last few years has been to use article submitters to submit your content to 100’s of article directories in attempt to get a load of backlinks and also to get your content ranked 100’s of times. Sounds good on paper right? Well there is a very inconvenient truth here. Google and other search engines don’t like duplicate content. Guess what you are doing when you submit the same content over and over to different locations? You are creating a wide web of dupe content. So that is bad and NONE of this content will get ranked. Secondly, and as discussed earlier, backlinks of this nature will negatively impact your website, often times getting it de-ranked entirely from the search engines. They are not stupid, in fact they have teams working for them that are much smarter than you so to think that you can simply submit the same bogus content to 100’s of places and expect results is somewhat absurd. Don’t you think? But, Hey There is Still a Lot of Hope For You! I have a rule that I follow and one that you should too when it comes to automation. If it makes the “quality” of my operations better, then I will consider automation. If it makes them even a little bit worse or lowers the quality of the experience for my visitors, then automation won’t be a good idea. Your audience is your bread and butter. If you are not automating in an effort to improve the experience for your audience, then chances are it is a bad idea. You ARE NOT going to trick Google….and you definitely are not going to trick readers. So, in summation here are some things to avoid with your business. If you can do this, you are going to see a lot more sunshine in your online business in the days, months and years ahead. Also, if any of this comes as a shock to you, chances are you need to get your hands on a real “online business” education and learn the proper ways to build and scale an online business. You can do that here. As always, I appreciate your feedback, questions and comments if you have any. If you have experiences with automation or processes or have been burned by any of the automation tools I have suggested to avoid, please leave a comment below. I’m glad I didn’t see automated social media sharing on the list. I have been scheduling posts to be shared on my social media sites (except Google plus, I do it manually) for 2 months now. Automated social sharing can be a decent thing, but not in the sense if you are not contributing any value on top of simply sharing the post. When you share anything to social media, you ideally want to consider your audience and get them engage in your content. To accomplish this you need to share your opinion along side the content you are sharing, or it will seem robotic and lead to far less trust within your social accounts moving forward. If you don’t seem real when you are posting, people are going to interact with you in a limited way. I can not tell you how much I am appreciating the things I am reading. Just beginning to blog I sure do not want to make these mistakes and waste my time. I call it caring when someone tells me there is danger up ahead. The desire to get all these fast and quick 1000 traffic and backlink packages was exactly what I had planned to do. Earlier said someone was banned from Adsense, can they ever return when that happens? Yeah, there is a lot of “bad” ideas that people are still trying to sell you on. The reasons are very selfish, because they make money doing so knowing full well (in most cases) that things like automated content, backlinking, clicking, and the likes can adversely impact your business. Most of the time the best and most powerful way to accomplish success with your website will be through hard work. Most are unwilling to do it, so if you do, you are going to have a competitive advantage. Exactly the case. Anything that can be gamed within the SEO world, will be gamed. Google will eventually patch up those holes in their algorithm and that is what they have done with in respect to people gaming backlinks. Lots of folks have lost their businesses (and rankings) as a result of trying to game Google search through backlinks. Well said Kyle! It’s sad that there are many people who seem to buy into the seemingly ‘automated’ ways to make a gazillion dollars while they sleep… Let’s face it… If you had the ‘secret’ method to increasing your traffic to your site, you’d be better off keeping it that way rather than sharing it with world + dog. I don’t see KFC selling their secret blend for $199 (30 day money back guarantee). So many people are looking for this simply because there are so many high profile scams out there (even by the so called “reputable” gurus) that claim that instant success is viable. It isn’t. There are proven ways to build a business online and there are no secrets about that. That is what we have been teaching at Wealthy Affiliate for the last 8.5 years with a very high success rate because we get folks to step into the reality of what it will take. Hard work, education, time and a bit of persistence. Anyone can do this, but the minute they try to find instant success, is the minute they are going to suffer a huge set back in their progress. Hey there kyle, while on the subjectof backlinking and indexing; do you do alotof social bookmarking such as reddit etc? It will serve little benefit, you can get a decent amount of traffic flow from some of the more popular social “bookmarking” sites like Reddit, but it should not longer be part of your SEO strategy. Also, do note that the traffic you receive from networks like this is FREE so it can and should be another angle if you want to immerse yourself in the community (like Reddit) and generate traffic from it. Well, I beg to disagree. You can’t get ranked in Google without backlinks unless you are publishing your content on a website that already has backlinks to it’s root domain, such as streetarticles.com or submitting guest posts to established blogs in your niche. But if you have a new website, trying to rank in Google without backlinks will definitely be a fruitless attempt, unless you are targeting the most obscure keywords, such as keywords that receive no searches at all. I would like to see you prove that you can rank for a decent keyword that gets at least 1,000 exact searches per month on a new domain without any backlink. In fact, I’d like to see a case study on this. Meanwhile, I’ll continue building backlinks because if it wasn’t for the backlinks I am building, I wouldn’t be getting anywhere near the 100+ visits I’m getting per day from Google – and this is to just one of my websites. Actually, you would probably be getting more than 100+ visits per day if you didn’t spend so much time on backlinks. Unfortunately Charles what is going to happen is that with every update, you are going to see a “hit” every time Google makes an update going forward as I do believe at some point they are going to completely phase backlinks out of their algorithm. Why? Because they are highly gamed and the fact that you can go out and just get “more” backlinks tells me right away something is wrong with that. Backlinks are continuing to get devalued and if you don’t have to be a genius to realize that everything that Matt Cutts talks about in his latest video leans more and more towards punishing sites that work to get back-links as it is the one component that people who don’t know what they are doing spend too much time with. I never work to get backlinks. The very site you are only gets 1,000’s of unique visitors per day, WITHOUT A SINGLE BACKLINK. I have many sites like this and I work with 1,000’s of folks that are doing the same thing. You can keep doing what you are doing, but I can tell you that it is not the way of the future. You are going to eventually get burned by “over seo’ing” your website and not focusing enough on the user experience, which Google is after. Hope this adds some clarity to the idea of backlinking for you Charles. I think the reason why you are getting thousands of visitors is because you have an outstanding online internet marketing community (I have to give you credit for that) and you are using the same name you are known by within the same community. Also, this site is within the internet marketing niche. Can you build a site like this in a different niche and start gaining 1000+ visitors per day without any backlinking? I very much doubt it. By the way, I’m a former paying Wealthy Affiliate member, so I’m not some newbie that just appeared from nowhere. I think I’m gonna implement your advice, but I doubt it will work. If you are automating back-links or making them a major focus in your SEO activities, then you are taking advice from someone with newbie knowledge or that are very outdated. I am by no means calling you a newbie, you are however doing things that will adversely impact your business. And yes, I can build a website in different niches and get lots of traffic without any backlinks. That is the point I am trying to get across here. Google does not give a rats about backlinks, they care about your content and your user experience. A backlink may help you get indexed quicker, but too many of them are going to look out of place to Google and you are going to end up in their “not so friendly” sandbox. Very well said Kyle. I tried an auto backlinking service a couple of years ago, and yes they delivered mega backlinks, none of which made any sense to me let alone google, result… I got banned from adsense. Thanks for getting the truth out about the right and wrong types of automation. Yeah, people are still doing this, but now they are calling it ethical backlinking. You don’t need to do any backlinking to obtain high rankings in search engines and I have proven this over and over again. Also, any program, SEO package, or automated script that will get you backlinks will kill any rankings that you have and red flag you for any future success that you may have had within search engines. Hopefully this thread will prevent others from getting sucked into the idea of automation schemes going forward and spending their hard earned money, but worse yet, killing their businesses potential because of one wrong move. About automation, propio yesterday I received an email from a certain Peter Garety ..
in his sales page offers a plugin “WP RSS Magnet” in which he says to bring traffic to your website automatically, from 3000 – 5000 visitors per week. What do you think about it? An absolute hoax…stay away from it Anthony. If you ever used this on your website, you would likely be looking at some really poor rankings and Google would be all over you for link spamming. Avoid at all measures! Great article Kyle. I was reading in the forums a while back on how people loved the auto backlink tools and the success they got. Then a couple months later they were on the same board saying they got flagged by Google. Bottom line, high quality content will win in the end. Thanks again. This happens all the time. The people that are touting the success of any tool of this nature is always short-lived. They find a little hole in Google’s algorithm, they expose it, Google patches it, they are out of business. The unfortunate part is that they end up creating a tool and selling it to 100’s of people (or more) and then all of these people go down in flames when Google swings their might fist with a Google Panda or Penguin update. I couldn’t agree with you more, quality content will always prevail and focusing on the visitor, not the process.